The Arturia DrumBrute Impact is an analog drum synthesizer / drum machine. It features an incredible 10 analog drum sounds that include a kick, two snares, hi and low toms, cymbal, hats and a cowbell! With these sounds you'll be making a full track in no time by creating your own patterns, once you have created these patterns you can then chain together your saved patterns for a fantastic live set. Its lightweight design and compact size make it a breeze transporting it to and from gigs or the studio. 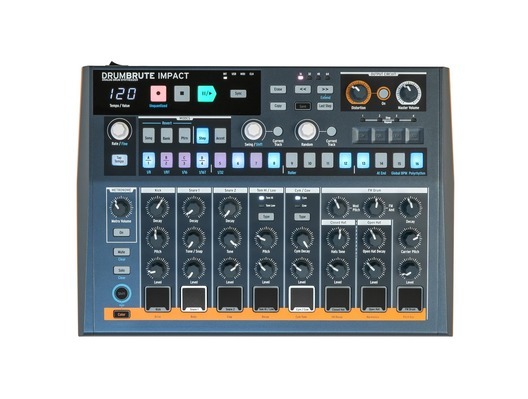 Putting the focus on Brute, DrumBrute Impact features 10 high-energy, refined, punchy analog sounds. You can also use the exclusive Colour sound-shapers to introduce unique, per instrument effect for some variation. Boost the harmonic content, add some drive, snap, or crack at the touch of a button, you can even automate tonal changes by creating a Colour sequence. If you want your drums to push even harder, use the built-in distortion on the output for some drum-optimized crunch. 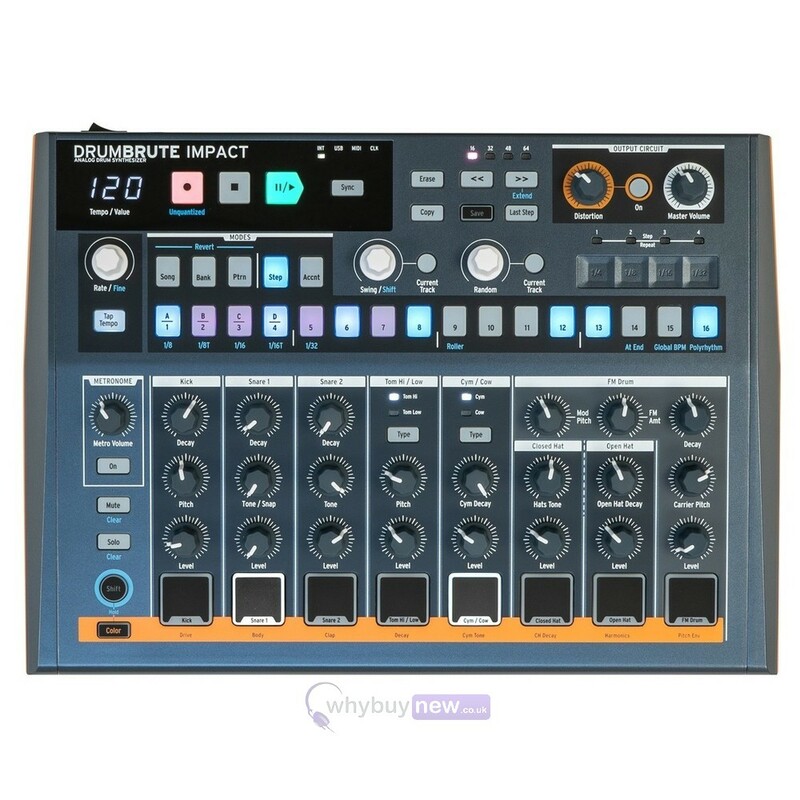 Whether you want to create complex, phasing polyrhythms or straight, pounding rhythms; record a finger-drumming performance; punch in a step-sequenced masterpiece; DrumBrute Impact beats to your rhythm. Use the touch strip to create some real-time glitchy, beat-repeat breakdowns, spice up a single instrument or your whole pattern with a dedicated Random knob, and add some syncopation and groove with the Swing feature. Get away from computer screens, say goodbye to sub-menus, and jump into the world of tactile, instant, analog satisfaction. 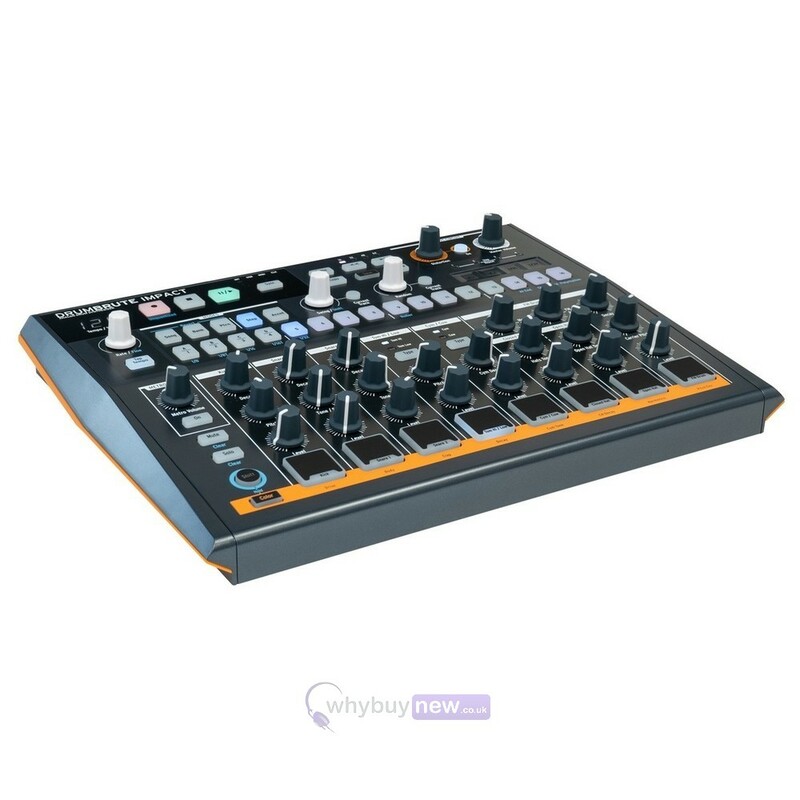 Featuring a huge array of sync and connectivity options, youll be able to hook up and jam with practically any other synth, sequencer, or MIDI-enabled instrument. Mix on the fly with dedicated controls for every function, multitrack, record, effect, and mix the sound your way with multiple bus outputs. Save patterns that you love, chain them together, and create full songs and live sets, all without looking at a single screen.